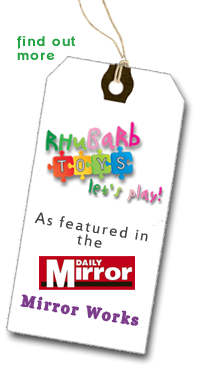 Created in November 2011, Rhubarb Toys is the creation of me, Emma Nicholls. I live in Flitch Green, Essex with my wonderfully supportive husband Omar and my two testing team heroes, also known as my children, Harry (6) and Siena (4)! One of my favourite places in the world is Normandy, France where my uncle lives and summer family holidays are a bit of a tradition for us, but whilst there, I always pop into their toy shops as the French manufacturers have a reputation for quality and toys built to last. I wanted to create not just a website that sells products but also offer a service to my lovely customers so if there is something you have in mind and you can't find it, please give me a ring - I love a challenge and one of my favourite pastimes is searching for unusual toys so let me do the hard work for you!